USB 110-volt Outlet an AWESOME Idea! I saw this USB power outlet online and I honestly will be installing a couple of these in my home office! 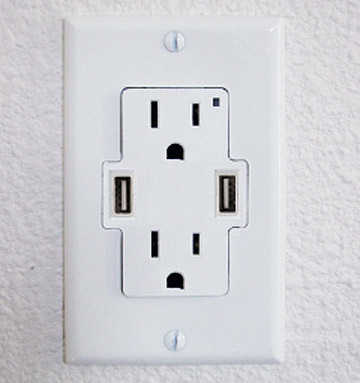 These are standard 110-volt outlets with two additional USB ports built right in. This would allow me to charge my iPhone, video camera, and the host of other USB devices I use in one convenient place! They are a little pricey for outlets at $10 each, but cool nevertheless! Now that’s sweet!! Where can I find these…I love the idea. I should have came up with something like this. Because it would work for just about any device correct? Yes this is a very smart device. I’m sure they will sell quite well. It’s not always convenient to plug usb devices into your computer or laptop. It would be so much easier to just charge those devices in an outlet like this. Those wall outlets are just the best idea ever! Expect to see them becoming the norm over the next couple of years. Now only if mobile manufacturers can decide on a common charger socket for mobile devices it would be great, wouldn’t it? Wow, this is really great item. It’s pity that’s only 110V. I live in europe and I need 220V. I think that this kind of device will be very popular nowadays when you have a lot of your electronic stuff charge via USB. USB Hard drives are common now, however any hard drive is just that, a HARD DRIVE. You won’t find RAM, CD-Rom, Broadband, Video Drivers, etc. on a HDD. Wow now that’s innovative thinking! I wonder how safe it is though compared to plugging it into your USB port of your computer. Yeah.. its really cool.. Its such a simple thing.. I wonder.. why someone didnt make it earlier..
An excellent idea! I did not know that such power outlets exist. This seems to be one of those ideas that are expanding in time giving us innovative solutions that we need to accept. I’m buying a house that already needs work, so buying a few of these would be another cool little thing I could do to it. This really looks like something handy. I would even say that I’m wondering why haven’t I see something similar in shops earlier? Because this seems to be an obvious idea but still brilliant. Please also note that the USB ports only draw power when something is physically connected to the port. Now only if mobile manufacturers can decide on a common charger socket for mobile devices it would be great, wouldn’t it? It is an interesting concept. However, this thing must use a transformer to convert the voltage. The transformers constantly drain power regardless of the current state in the charging cycle of the device. This leads me to thing that it will end up constantly leaching power and potentially raising your power bill if you actually remove the charger from its socket occasionally. Also, I am a bit hesitant about adding a computer IO port of any kind permanently to my house. Regardless of how “standard” they are right now, they will end up going away as better IO ports come out. It’s a lot like the legacy my parents had in their old house that did nothing more than ugly-up a wall after they went obsolete.